Below we have seven quotes that you may have seen attributed to Gandhi on social media recently. But they’re all fake. 1. Be the change you wish to see in the world. 2. An eye for an eye will make the whole world blind. It’s another pithy quote that definitely Makes You Think™, but there’s no proof that Gandhi ever said it. From there it seems other writers morphed it into a direct quote from Gandhi. It really is a great quote, but it’s not from Gandhi himself. 3. Live as if you were to die tomorrow; learn as if you were to live forever. 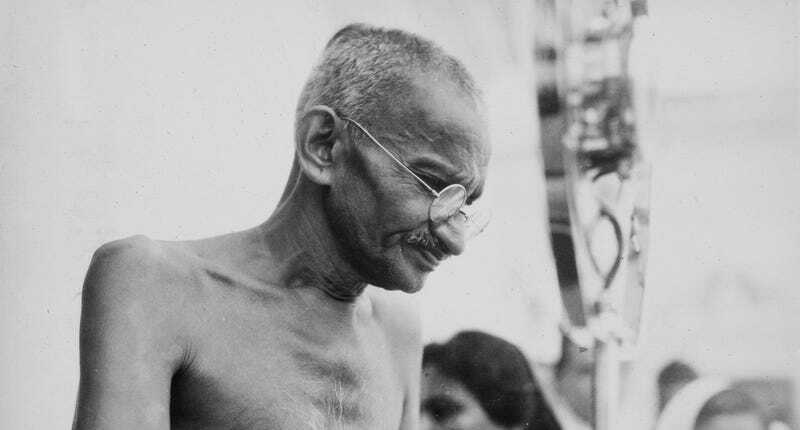 Versions of his quote show up in print as early as 1867, where it is more commonly repeated as “Study as if you were to die tomorrow...” rather than “live.” Gandhi was born in 1869, making it impossible that this quote originated with him. The quote is attributed to a handful of different people in books published during the latter half of the 19th century. One book says it comes from the Catholic saint Edmund Rich who died in 1240. Other books attribute it to a man named Ansalus de Insulis. Whoever said it first, it wasn’t Gandhi. 4. First they ignore you, then they laugh at you, then they fight you, then you win. First they ignore you. Then they ridicule you. And then they attack you and want to burn you. And then they build monuments to you. And that, is what is going to happen to the Amalgamated Clothing Workers of America. For what it’s worth, I’m unaware of any monuments to the Amalgamated Clothing Workers of America but maybe they’re overdue for one. 5. I like your Christ. I do not like your Christians. Your Christians are so unlike your Christ. This quote has actually become popular in some Christian circles to implore followers that they should “be like Jesus.” But there’s no evidence that Gandhi ever said this. This is another incredibly famous quote that has been linked to Gandhi for decades. But it seems too good to be true. As Quote Investigator points out, the evidence that Gandhi actually said this is incredibly weak. The first known mention of this quote is in a CBS documentary from 1967, nearly 20 years after Gandhi’s death. The anecdotal quote was relayed by the narrator rather than film footage of Gandhi actually saying such a thing. And perhaps most damning, Ralph Keyes, author of the 2006 book The Quote Verifier, says that no reliable biographies written about Gandhi include this zinger. You may find it silly that anyone would believe Gandhi talked like a motivational speaker at a sales convention. But plenty have been taken in by it. Who actually said it? The quote is probably from a VP at the Studebaker car company circa 1941. Which makes a whole lot more sense. Gandhi was many things. But he wasn’t a person known for talking about the importance of customer service to keep a business alive. I guess someone should tell that to the author of Gandhi, CEO.